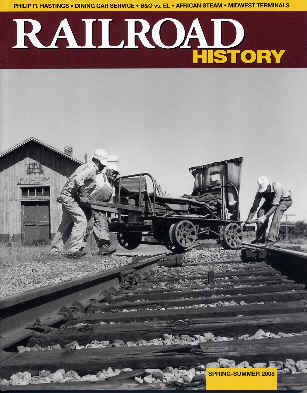 Welcome to Birmingham Rails, a web site about railroads and industries in and around Birmingham, Alabama. This page is intended to share my interests in railroads, history of technology, and my perception that there is a lot of great railroad history and activity in Birmingham, Alabama. I have gathered information and learned a lot about Birmingham since moving here in 1992. I enjoy telling the story, as I have learned and interpreted it. In sharing this information on this web page, I will approach this as though you are visiting my personal library and files, which are meager. Thus, I will share freely information that I have obtained in pursuing my personal interest. I will treat this like a research paper, and intend to give credit to the source of information, both written and graphic. Photos and other graphics are borrowed freely from other sources, and I will attempt to footnote these. The intention is not to "steal" other's information, but to share what I have in the interest of learning about a subject that I enjoy. If you were here, we would look at materials prepared by others. With the internet, there is a new opportunity to share published information on the Web. It is not my intention to abuse this privilege, only to share this for the enjoyment of others. There are many things of interest in the Birmingham area relating to industrial and railroad history. In recent years the community has added Railroad Park and Red Mountain Park to go with Ruffner Mountain Nature Center. In addition there are active rail history groups as well as model railroading groups. Check out this website and learn more about Birmingham's rich history as well as some of the local attractions and organizations that can help you stoke the fires of your interest. Birmingham is home to the Railway & Locomotive Historical Society (R&LHS) Mid-South Chapter. Meetings are held at the historic Leeds Depot. For more information click on the magazine cover at the left. The Birmingham District Model RR is the author's steam era HO scale layout that seeks to interpret Birmingham's industrial district's remarkable rail activities. The railroad is operations oriented using the JMRI software Operations Module. The NMRA's local Steel City Division (SCD) meets monthly at Vestavia Hills United Methodist Church. The SCD is part of the Southeastern Region (SER) of the NMRA. For current information on the Red Mountain Park visit the Friends of Red Mountain Park website. Be sure and check at all the features of their website, including Dave's Blog and the You Tube links with oral history video's. Take a look at this website's section on Red Mountain Park -- site of former mines. Support the Bessemer Hall of History , one of the area's great resources. Consider becoming a supporting member -- it is a great value and a worthy historical resource. The Birmingham Jefferson County Historical Society changed their name to the Birmingham Jefferson Historical Association. They have been the prime mover for the opening of a Birmingham History Center. 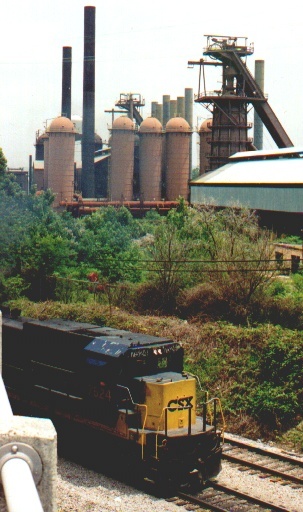 The Spring 2006 issue of Classic Trains Magazine has a wonderful view of Birmingham industrial railroad activity, Final Fires of Birmingham by Birmingham rail historian Thomas Lawson, Jr. The November, 2003 issue of Railroad Model Craftsman Magazine contained a great article on a Birmingham theme model Railroad, Birmingham, 1950. Additional pictures of Ken's Layout. 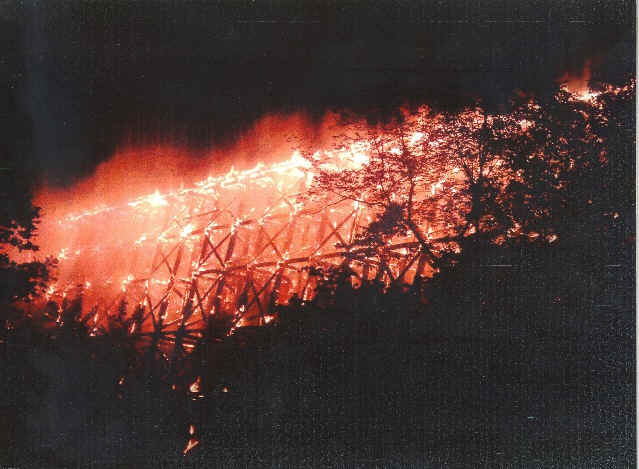 Newfound Creek Trestle on the Cane Creek Branch burned 5/23/06. 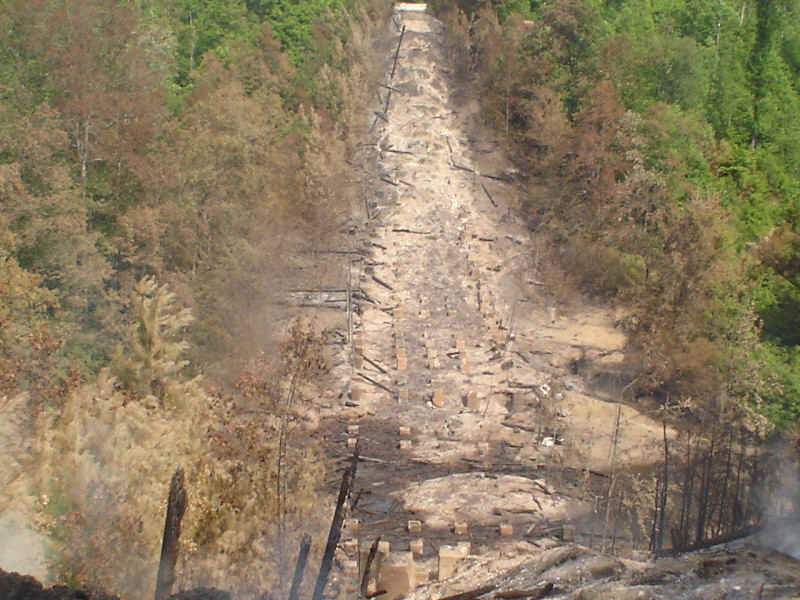 This is a great loss in Jefferson County -- one of the highest RR trestles in the southeast at about 115 feet tall and about 650 feet long. Originally built between 1901 and 1903, the trestle was rebuilt at least once to reach its most recent configuration. The fire photo is by Paul Kennedy, courtesy of Marshall Farmer. Reports indicate that fireworks may have caused the fire. The photo of the aftermath is by Eric McFerrin.